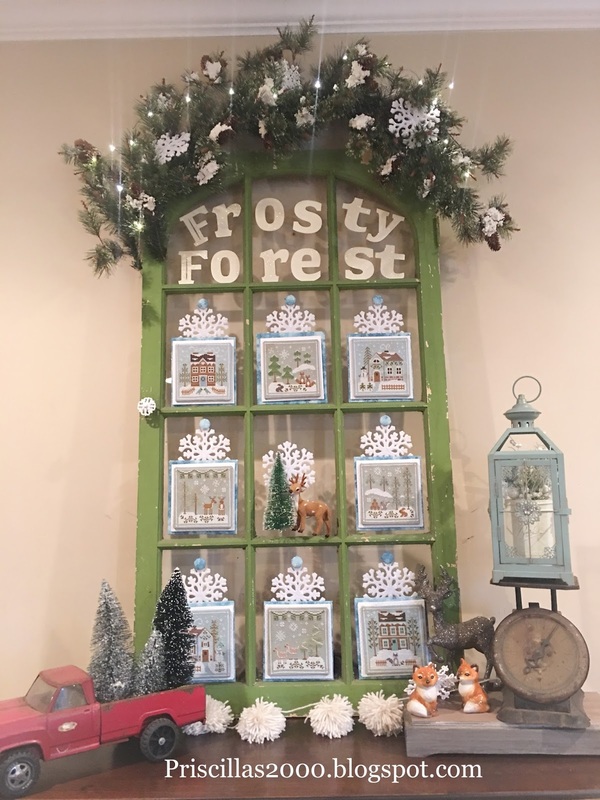 Priscillas: It's A Frosty Forest! Woohoo! Look what I finished! So.. I started the Frosty Forest collection from Country Cottage Needleworks in January .. I was going to stitch one a month and I stuck to that for the first couple months then that went out the window! But I rallied here at the end to finish it! I stitched them with the called for threads and used tea/ coffee dyed light blue evenweave.. 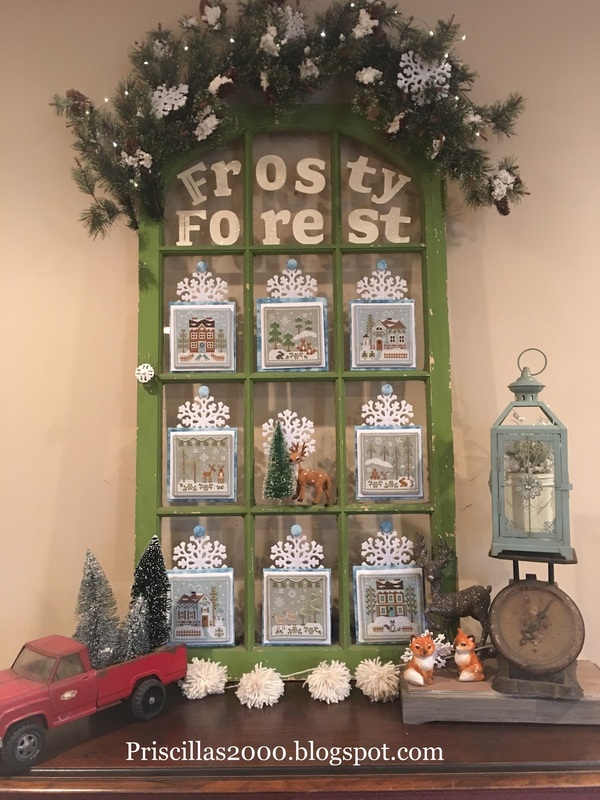 I knew I wanted a window to mount them in and it was hard to find one with enough panes.. but I found this one at the last flea market Chelsea and I went to.. It came this green color which is about the same green used in all the trees that were stitched..and the chippiness of the paint was already there! I did change out the knob because it was just a plain silver one..It is so great when what you imagine actually works out perfectly! I mounted the stitching on sticky board.. then a mat of white on white polka dots..then a mat of aqua snowflakes.. I then glued the whole piece to a snowflake and added a covered button to the top of each one.. 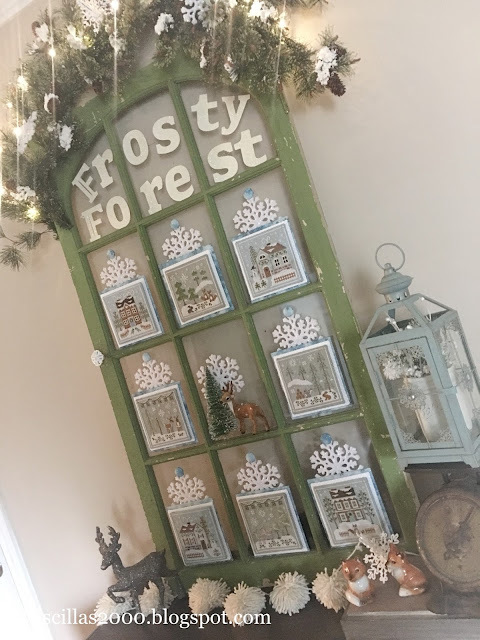 I used magnets and sheet metal to attach them just in case I find another series to stitch up for the window..
Chelsea cut me the frosty forest letters on her Cricut and I glittered them .. The top is a wreath I found at a church rummage sale for 1.00 my husband cut it in half and the wires from the wreath slip down over the top to hold it in place.. I added battery operated lights and a couple snowflakes to the flocked greenery ..I knew I wasn't going to stitch the center word chart so I took the base off a bottle brush tree , cut the back off of it and glued it and a felt deer to another snowflake.. It is also attached with magnet and sheet metal..Can I tell you how excited I am that it is finished ! I think it will be placed on our stair landing ..I just put it here for photo taking! OOOOH!! I may have said this before (and I reserve the right to say it again) but that is my very favorite of your finishes from all time! That is so delightful! Wonderful work! OMG that is beautiful. Love, love, love it. Beautifully done. Congratulations Priscilla. Award winning. Wow, Priscilla, this is so incredible! 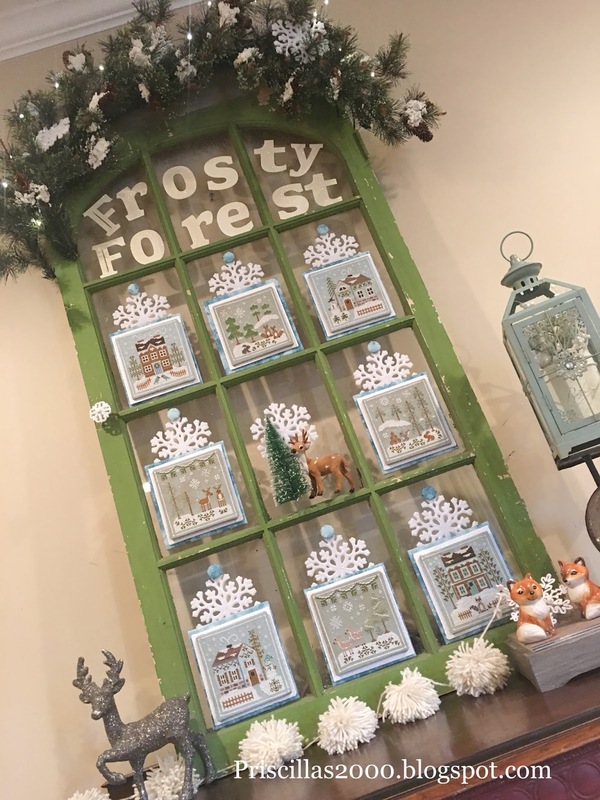 What a fun, beautiful way to display your stitching! Your creativity knows no bounds and is so fun to see. WoW!!! Oh my goodness gracious! This is absolutely perfect! Congratulations on a stunning finish! Oh Priscilla! This is absolutely wonderful!!! You have out-done yourself!!! I love it and will now be on the look out for a special window to complete one of my projects with!!! You are a constant source of inspiration on so many levels! Thank you for sharing your beautiful work and ideas with all of us!! This looks so amazing! I have all of these stitched, but I did them as one piece, now will have to figure out how to make it look as good as what you have! That won’t happen, lol! This is absolutely BEAUTIFUL!! Love it to pieces!! Checking in regularly to catch your Xmas décor. This is an amazing idea!!! Perfect for the stitched pieces!!! Wow! This is amazing. I love your creativity in both finishing individual pieces and your displays. How beautiful. You inspire me always! You have seriously outdone yourself on this one. I don't think I have seen anything cuter. LOVE LOVE LOVE. 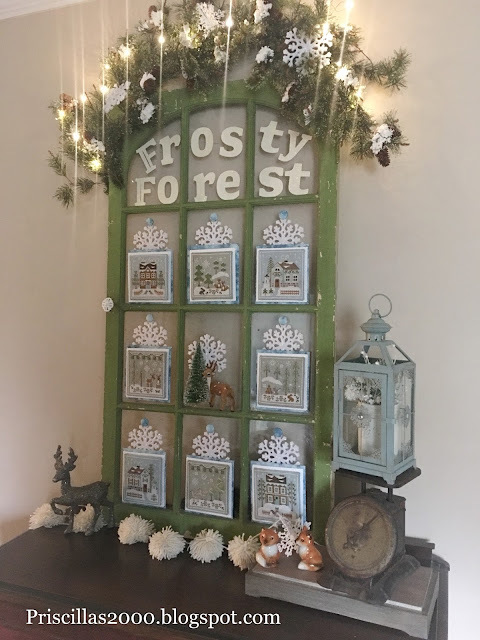 Hi, I'm fairly new to your blog and am amazed at your finishing ideas...very clever, creative and FUN!!! I get the metal sheet/magnet idea to attach the stitching, but how did you attach the finished pieces to the window....inquiring minds want to know!!! So, so, so, so perfect! You are truly a creative genius - WOW !! This is absolutely, positively GORGEOUS!!!!!!! You have inspired me and many others, to pick up our cross stitch and stitch away!!! I love your finishes but this one is outstanding!! Thank you so much for always sharing!!! Awesomeness! You have to be the most creative person I know. Wow! That is a Masterpiece! Lots of beautiful stitching, mounted so beautifully! How wonderful! I have done a few finishes based on your delightful works, and love them! I think I posted one so far... just finished the other two! Have to just blog again! Thanks for sharing! By the way, love the flosstube videos! Still can't comment from my t.v. tho... Hugs! Love the floss tube videos. Don’t understand how to leave comments on them. Can you do it on cell phones or do you have to be on a desk top computer? Does Chelsea know? I love your imagination for displaying your creations. This is just so very beautiful. Wow. That was a wonderful way to show those designs. What a creative mind you have!!! This is genius! Great idea and thank you for sharing it with us all. Oh my! This is just fabulous!! I love what you've done. You're imagination on how to mount and display your cross stitch makes my head spin! You're fab!! I'm amazed at your finish, it is simply stunning. Giggled at you saying your plans went out the window and look now - they are all literally in a window! O My Goodness! This is amazing!! Love it!! You are so talented! !